I am very excited to bring you the second interview this week with a debut YA author. Today's guest, Leah Cypess, is a fellow member of the class of 2k10, and her new release, Mistwood, comes out today! The Shifter is an immortal creature bound by an ancient spell to protect the kings of Samorna. When the realm is peaceful, she retreats to the Mistwood. But when she is needed she always comes. Mistwood has been getting amazing reviews, including a starred review from Kirkus that called it "astonishing and inspiring." And if you know anything about Kirkus, you know they're a pretty tough audience. "Edge-of-the-chair reading, with enemies and betrayal at every turn!" "Intriguing and illusive...with an incredibly executed twist that fits like that very last, perfect puzzle piece. A one-sitting novel!" "An unusual, suspenseful fantasy that is propelled by well-placed clues." Leah was kind enough to take time out of her busy pre-release schedule to answer my Mostly Debut Author interview questions. It's been a while since you've seen them, since I ask an abbreviated list for the Girlfriends' Cyber Circuit. I'd forgotten some of them! Q. What's been your biggest surprise/thrill about your first release? The fact that it’s happening! I have wanted to be a writer for so long, and have been seriously submitting manuscripts for so many years, that I was really starting to think it never would. I had imagined being told, “We want to publish your book!” so many times that when I finally did get an offer, it felt like it wasn’t real. And incredibly, it was with one of the imprints I have always most wanted to work with. Hard to say I’d want to be any of them… I’m kind of tough on my characters. :) I’ll have to choose Isabel, though; in a way, I feel like I was inhabiting her life when I was writing her. Q. Conversely, which of your characters would you most like to bring to life in our world (maybe as a best friend or much, much more ;-) ? Q. Same two questions, but use examples from another author's work (including television/movies/theatre)? I would love to be Buffy the Vampire Slayer. Walking around all little and fragile-looking, and then someone starts up with you and WHAM! As for a best friend, Kaylee from Firefly would be an awesome person to hang out with. Hmm, maybe I should just ask Joss Whedon if he would write my life for me. I’m intermittently working on a time-travel book that is giving me a lot of trouble, and I would love for Connie Willis to come fix all its problems for me. Because I’m sure she could, in about three seconds. I have a terrible fear of flying. It’s unfortunate, because I really like being in faraway places, and usually you have to fly to get to them. Q. Let's say there's a TV show, movie, or recording artist that has a cult of you. Which is it? (i.e., what do you like that no one else you know likes)? Q. If you had a free day with no responsibilities and your only mission was to enjoy yourself, what would you do? Q. If you could write in a totally different genre than your current one, which would you choose? There’s nothing stopping me from writing in a totally different genre than my current one – in fact, I am currently working on a straight historical novel set in the 16th century. Of course, I have been working on it for the past 10 years and probably will be working on it for the next 10 years, because that kind of intensive research is hard to find time for. I will finish it someday, though! Q. What are you working on now, and what new releases can we expect to see from you down the road? Q. The forest plays an iconic role in MISTWOOD, as it does in many fantasies. Why do you think forests evoke such strong feelings of magic and mystery? What is it about them that humans simultaneously desire and fear? I grew up going to summer camp in the Catskills, and I always noticed the difference between the forest during the day and during the night. During the day, the forest was a beautiful place in which to have adventures; I used to sneak off from scheduled activities and go hiking alone (NOT recommended; I’m lucky I never got seriously injured when no one had any idea where I was). But at night, walking back from campfires, the forest was seriously scary. The trees always seemed hostile and menacing, like they didn’t want us there. Q. I noticed on your website that you spent some time drawing fantasy scenes during law school classes. :-) Do you still draw in your spare time, and if so, do you find that it helps your writing? Giant congrats to Leah on her wonderful debut! I can't wait for my copy to arrive in the mail--it better be here when I get back from RT on Saturday. Speaking of which, I generally don't blog when I'm at conventions (too exhausted), so if you want to see what I'm doing, check out my full RT schedule, or follow me on Twitter. Hope to see some of you there! Today's guest on the Girlfriends' Cyber Circuit is Jessica Brody, author of The Karma Club, her debut YA novel! Seriously, don't you want to read the book from the title alone? But wait, there's much, much more! Keep reading for all things Karma Club, including a very fun book trailer and your chance to win one of four Flip Phones! Madison Kasparkova always thought she understood how Karma works. Do good things and you'll be rewarded, do something bad and Karma will make sure you get what you deserve. But when Maddy’s boyfriend cheats on her, nothing bad comes his way. That’s why Maddy starts the Karma Club, to clean up the messes that the universe has left behind and get back at the people who have wronged them. Sometimes, though, it isn’t wise to meddle with the universe. It turns out Karma often has plans of its own. "Written with wit and panache. Readers will have fun with this one, and it might make them think a little, too." "A well-paced comedy, with a nice balance of cinematic physical humor and genuine teen emotions." Check out this trailer and play "spot the celebrity"! To celebrate the release of The Karma Club on April 27, Jessica is giving away FOUR Flip Video Cameras (as well as TONS of other cool prizes!) on her site. Visit her website for all the details and to enter to win! 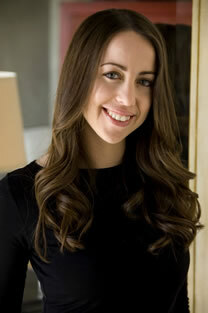 Jessica Brody is the author of two books for adults. 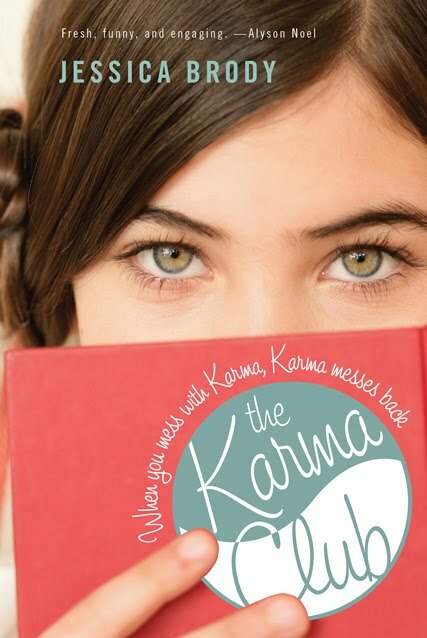 The Karma Club is her first book for teens. She currently lives in Los Angeles, California where she is working on her next novel. Despite what some people from her high school might claim, she has never sought revenge on an ex-boyfriend. Visit her online at: www.jessicabrody.com. And now...my interview with Jessica! I suppose I’d have to choose Maddy from The Karma Club. Although I don’t envy her for having to deal with a cheating boyfriend and the stuck-up queen Bee who stole him. But she does have some very awesome friends to support her. And then there’s that new guy in the picture who’s pretty freaking cute. I wouldn’t mind hanging out with him for an afternoon! Well, I haven’t done it yet, but next month I’m scheduled to go “under cover” at a fast food restaurant. In the book I’m writing now (52 Reasons to Hate My Father), a teen heiress is forced to work at a fast food restaurant and since I’ve never worked at one, I need to get to find out what it’s like. My friend owns a Taco John’s restaurant and he’s bringing me as a new employee so that I can be trained like it’s my first day. I told him not to tell any of the other employees what I was doing so I could get the “real experience.” I’ve never been more excited to make tacos! But what I’m really looking forward to is working the drive-thru. I’ve always wanted to wear one of those headsets. “Welcome to Taco Johns, can I take you order?” How did I do? Oh that’s easy. Cheesy, bubble-gummy, teeny-bopper pop music. I love it to death! Especially the stuff from the UK. They do pop music better than anyone! I have stuff that would make your teeth hurt! My husband can’t stand any of the music I listen to. When asked in an interview once, what’s his least favorite type of music, he replied, “Whatever is in my wife’s CD player at the moment.” Haha! It’s the biggest joke between us! I don’t know if I’d call it a phobia, per se, but I have this really weird thing about bones. I’m totally squeamish about them. No one can crack any bones around me. And I can’t have my bones touched. My hip bone is the worst. I don’t even like touching it! It’s very odd. I think something terrible must have happened to me (and my bones) in a past life! Thanks to Jessica for taking the time to answer my questions, and big congrats on your teen debut! Next week on the Girlfriends' Cyber Circuit tour is...*gulp*...me. I haven't decided if I'm going to "tour myself" and answer my own questions. I've never thought of any answers! A convention, two bookstores, and a red-velvet-draped bar. For directions and more details, click on the links for each event. For a complete list of events this year, check out my Facebook "fan" page event section. Details: Booksigning with over 300 authors! Open to the public for a $5 admission at the door. Free for attendees of the RT Booklovers convention. Details: Reading, discussion--and most important, delicious cookies and brownies from Westminster's Starry Night Bakery. Details: Part of Lady Jane's Salon reading series. I'll be reading from SHADE and taking questions, then autographing, then enjoying a social hour to celebrate the next day's release. Drinks are only $5--that's right, five-dollar drinks in Manhattan. Admission is $5 or a gently used romance novel. Where: Borders, 2420 S. Pleasant Valley Rd. If you can't make any of these events but would like a signed copy, you can pre-order Shade through Constellation Books (410-833-5151 or online). Let them know if you want me to personalize it or just sign my name. This blog is now located at http://blog.jerismithready.com/. Today on the Girlfriends' Cyber Circuit is the debut author of a very highly anticipated book, The Cinderella Society. I present to you...Kay Cassidy! But before my interview with Kay, let's learn a little about her novel, shall we? What's a girl to do when the glass slipper fits, but she doesn't want to wear it anymore? Sixteen year old Jess Parker has always been an outsider. So when she receives an invitation to join The Cinderella Society, a secret society of the most popular girls in school, it's like something out of a fairy tale. Swept up by the Cindys' magical world of makeovers, and catching the eye of her Prince Charming, Jess feels like she's finally found her chance to fit in. Then the Wickeds--led by Jess's arch-enemy--begin targeting innocent girls in their war against the Cindys, and Jess discovers there's more to being a Cindy than reinventing yourself on the outside. She has unknowingly become part of a centuries-old battle of good vs. evil, and now the Cindys in charge need Jess for a mission that could change everything. Overwhelmed, Jess wonders if The Cinderella Society made a mistake in choosing her. Is it a coincidence her new boyfriend doesn't want to be seen with her in public? And is this glamorous, secret life even what she wants, or will she risk her own happy ending to live up to the expectations of her new sisters? I opened the card, my hands trembling in dread and the faint remnants of what I used to call hope, as a tiny silver high-heel pin bounced into my hand. Your presence is requested at The Grind. Kay Cassidy is the author of teen fiction she wishes was based on her real life. She is the founder of the national Great Scavenger Hunt Contest(tm) reading program for kids and teens and the host of the inspirational Living Your Five(tm) web project. In her free time, she enjoys yoga, movies, music, and reading. Lots and lots of reading. She hopes her debut YA novel, THE CINDERELLA SOCIETY (April 13, Egmont), will help girls embrace their inner Cindy. Probably Cammie from Ally Carter's Gallagher Girls series. The spy school world is completely amazing to me – how cool would that be?? As much as I adore Jess and Ryan in The Cinderella Society, I would actually want to bring Heather to life. I just want to give her a big hug and tell her everything is going to be okay. I can't think of a weird tidbit, but I did incorporate some mind-blowing stats about girls and body image. The statistics broke my heart. Probably J. K. Rowling. And really, it wouldn't even be collaboration I was after. I would just love to chat with her about the world of Harry Potter and how it looks in her mind. Thanks to Kay for stopping by, and congrats on the debut! Now everyone, go out and find your inner Cindy! What do you think? I'm not normally a huge fan of trailers (I don't even like music videos anymore because they often skew my perception of the songs, a perception that tends to be personal and sometimes, er, quirky), but I really like this one. Then again, it is possible that I am ever so slightly biased. Shade comes out May 4, two weeks from tomorrow. *heart attack* To quote from the book, "Get the defibrillator!" I'm excited to report two, highly related SHADE-y developments. My first solo signing of Shade will be Sunday, May 2, 3-5pm, at Constellation Books, a lovely independent bookstore not far from chez Jeri (BTW, that's pronounced "shay jher-EEE") in Reisterstown, MD, pictured here. I don't know who the guy in the vest is. Presumably a public safety official of some sort. But no worries--it's a lovely neighborhood in a lovely town. If you're familiar with Reisterstown but not with Constellation Books, it's across from Java Mamma's and on the same side of the street as the Cow, which, according to its Facebook fan page, rocks. Anyway, there will be a reading, Q&A, and most important, baked goods (a redundant phrase if there ever was one) from Starry Night Bakery, the coffee house where I spend every Wednesday with my local writer friends. I promise to read a G-rated selection from Shade, and Constellation has a fabulous children's section, so bring the whole family! So what's in it for the rest of you, who can't make it to Reisterstown? If you order your copy of Shade from Constellation Books, at any time before or after the launch party, I will sign it for you. If you order it before the launch party, obviously, I will sign it that day and it will be shipped out the following day--the day before the official release date. You'll be supporting a wonderful independent bookstore. Y'all know the importance of that. You'll get an autographed book, personalized if you like. You might even get it sooner than if you ordered from an online bookseller, who probably won't be shipping until May 4. It's not just win-win, it's full of win! To get your signed copy of Shade, either call the bookstore at 410-833-5151, or place your order online, and when you get to the order page, note in the comments if you want it personalized. Otherwise it'll just be a plain old autographed first printing, suitable for future eBay transactions. I'm off to spend a three-day weekend finishing the rough draft of Shift. Wish me luck! No, wait, I have plenty of that. Wish me caffeine and discipline! Fantabulous news! I'm now free to announce that in the last two months, my amazing agency (Curtis Brown, Ltd.) has sold the French, Spanish, and German rights to Wicked Game, which was first published in May 2008. Its sequel, Bad to the Bone (originally published May 2009) will also be translated into French and German. I'm tickled beyond belief at these first foreign sales for this series. I can't wait to see the new titles and covers, and how some of the (very colloquially American English) lines in these books will be translated. The butterflies in my stomach vomit on each other's wings. Maybe he was de-cockinated in a tragic vamp-f***ing accident. Good luck with that, foreign publishers! Bragelonne will be publishing Wicked Game and Bad to the Bone in French, within 18 and 24 months, respectively (hopefully sooner). Versatil will be publishing Wicked Game in Spanish (not sure of dates yet), with an option on Bad to the Bone. Lübbe will publish Wicked Game and Bad to the Bone in German, within 24 and 30 months, respectively. I will be sure to share covers as soon as I see them. Yay, Ciara! Go show "Old Europe" a good time! I'm back! Okay, I didn't actually go anywhere, but I'm trying like crazy to finish a rough draft of Shift ASAP so my critique partners have time to read it and give me feedback in the next month so that I can rewrite it and give my editor a second draft instead of a crappy first draft ("crappy first draft" is a redundant phrase). To demonstrate the importance of that process, I'm writing a series of guest blog posts at TeenReads.com, where you can get a behind-the-scenes peek at the creation of Shade. The first installment went up last week, called "Putting the Shade in Shade." 1. Facebook fan page - I'll draw a name at 5pm Friday from the members of the page to win a signed final copy of the hardcover book. All you have to do is become a fan! Beyond giving you a chance to win a free book, the fan page is your best bet for hearing the latest on my contests, news, and events. 2. Class of 2k10 April giveaway - Comment to win a signed ARC of Shade, a signed hardcover of Rhonda Hayter's super cute middle-grade debut, The Witchy Worries of Abbie Adams, and much more! 3. Rosemary Clement-Moore's Nothing But Nets giveaway - To celebrate the paperback release of her YA novel Highway to Hell, the always awesome Rosemary is giving away a ton of prizes, including a $100 gift Barnes & Noble certificate, an ARC of her next book, and many other author-donated prizes, including a hardcover copy of Shade. All you have to do to enter is donate to the United Nations Nothing But Nets campaign, to provide low-cost mosquito netting to malaria-vulnerable areas. I hate to say this is an “important” book because it brings to mind words like – boring – lecture – preachy, and this book is none of those things, but I do think it is an important story to read. Not much is written about boys who suffer from abuse and the effect that has on their relationships. Off to sleep now. Tomorrow I'll have a very exciting announcement about the WVMP Radio vampire series!